Ever since the No Reservations Philippines episode of Anthony Bourdain, I have received dozens and dozens of requests to purchase the same kind of lechon served in that show. The subsequent feature on Jessica Soho’s program only increased the inquiries for the accupunctured pig. I have steadfastly responded that it is not for sale. Well, now it is. At least on an experimental basis. My office crew in Cebu have been on my case to allow them to try their hand at an entrepreneurial effort, so the result is ZUBUCHON. Zubu was the designation for the island of Cebu in a few of the really old Spanish and Portuguese maps of the Philippine archipelago, so ZUBUCHON is the crew’s brand name for our unique style of lechon. Now first let me say what ZUBUCHON is not. We do not use MSG. We do not use mixes of any sort such as sinigang mix, ginisa mix, etc. We do not use paintbrushes to paint the skin with soy sauce, and we do not use blowtorches to even out the caramelization of lechon skin. We do not use very large pigs for sale by the kilo (these pigs at 45+ kilos live weight tend to have more fat content). We do not extract any of the prime meat inside the pig before cooking (some folks remove the tenderloins). We do not have a smooth shell-lacqued skin. So if you live in Cebu, and have been pining to try this pig, now is your chance. The crew is going to try their hand at running this lechon business from now until the Christmas holidays, to see how it fares. Any profits at this point will be split amongst all of the crew that participate in the effort. No profit will accrue to Marketman. And remember, this might not be what you normally expect in a lechon. What you will get is something with a slightly uneven colored and blistered skin, that looks less traditionally “attractive” but which is hopefully quite crisp, and whose meat is naturally perfumed with fresh herbs and spices. Free Delivery within 15 minutes drive of the Capitol building. Price is based on the size of pig, not the supposed number of people it might feed. And if you compare prices with others, ask them for the approximate LIVE and COOKED weight of their lechons. I so want to be in Cebu right now! argh! i’m seriously craving lechon skin and buy-on right now! I wanna go to Cebu just for this! This is a great initiative by your crew, MM. Now, I want to go to Cebu to try this! it is so nice of you to let them in on the business of the lechon you popularized. the more i admire you for sharing with them your wealth of knowledge and giving them the chance to make their own wealth. kudos, mr. mm. Labor of love for an accupunctured zubochon! I can already feel the sensory delights from the aroma steaming out of the vents to the crunch as one takes the first bite of the puffed skin. Good luck to the crew on their entrepreneurial venture! I want to know where i can stay in CEBU? at least the nearest where i can feast! how fast is the travel time from manila to cebu? i have to bring my family of 4 just to do some touring around and try this ZUBUCHON! MM, your guys are incredibly enthusiastic and we (spouse, child, nephew and I) are thrilled to bits we can bring some home on Sundays! It is delicious! I wish your crew all the luck in the world. They are embarking on a business venture that seems to be more a labor of love than anything else. They say however, that at times one must “make their own luck”! I personally believe in that mantra. I can see it now: Zubuchon restaurants all over. A 3 -shift operation to cook the lechon to support a delivery schedule to Manila, Davao, Bacolod, etc. An Airline/Airfreight operation that will put Fedex and UPS to shame (call me when you are ready for this part – I spent my entire career doing this). But wait, I want in on the action! I would assume you put your sharp “pencil” on this business plan and so there must be a modicum of success in the near future, How about I invest in charcoal production? You guys will need lots of that and to corner the charcoal market seems like a plan to me! And you guys are going to need freight containers! A purpose designed unit lined with insulated tin foil so temperature is retained and the lechon arrives in Manila still hot! Hooboy, you guys are going to be busy. But hey, call me. I will help and I swear I come cheap. All I need is a piece of lechon cheek once in a while! ha! am craving for it by just looking at it right now..am sure the venture would be a huge success and the crew would get their hands full and would need to do some really good planning when the business needs to expand to accommodate the orders…but then again, mm, you will be there to guide them…good luck!!! Catering option to prepare fresh kinilaw on site upon delivery of lechon? I loved the eyeball combo of kinilaw and lechon. To all Cebu residents who plan to try a kilo or two of Zubuchon at the Banilad Town Center (BTC). I stongly suggest you come early to get choice cuts. The Sunday market at BTC started 3 Sundays ago and Zubuchon has been enjoying brisk sales. Two-thirds of the lechon is usually gone by noon and the crew already have “regulars” who come in every Sunday to get their fix of the “best pig ever”. When I saw the title, I first thought today’s entry was about another Keller restaurant: Zubuchon…Bouchon…Hmmm. Hehe. Good luck to you and your crew! Gener, the Manila-Cebu flight is one hour. The nearest hotel to MM’s office where Zubuchon will likely be roasted, is Mayflower Inn. You can also stay in Casa Escano on Juana Osmena St. An added treat in Casa Escano is being able to taste the best ensaimada ever at breakfast — Artisan Chocolatier’s brioche. Where are you traveling from Gener? If you need survival tips in traveling to Cebu, post a comment here. wishing you and the crew much success. i admire your support and encouragement for your crew to continue and share this perfected craft of the lechon roast. this little start-up is fueled by passion and pride of artisanal excellence. Long may it grow and prosper. I will have my bite into a crunch of skin maybe next year! Thanks for your answer. My flight is actually from Morocco to qatar then from qatar to manila but i checked today from the airline that there is actually a flight direct to cebu which makes my travel path easier. I may stay in cebu for few days then travel back to luzon to continue my vacation there. Well any help from you guys there is big for me since i never visited cebu yet. Ill try to visit all those places you mentioned as part of the vacation thrill…thanks again. I’m going to try this when I go to Cebu this Nov. BTC isn’t too far away from my hotel. Thanks MM! but hey MM, sobrang mura ng Zubuchon compared to commercially available ones, and you only use premium ingredients huh! all the luck to your crew MM! yeheyyy! hooray for the crew! wishing you the best of luck, everyone! just ordered a whole zubuchon for my birthday last sunday. may have been one of the best birthday gifts i’ve ever given myself! May your crew be blessed with 1000 + Zubuchons!!!! I bet they see Zubuchons even in their sleep! A word of advice to the crew…maybe while the ink hasn’t dried yet, it is not too late to add THE ORIGINAL to the Zubuchon….this is just a suggestion! …and I call first dibs to being SILLY LOLO’S executive assistant, Doc! Very nice! Zubuchon… I like it! Very catchy! I wish your crew well and I hope they sell lots and lots and lots!!! Good luck & best wishes on this venture! I just hope that by the time I make it to the philippines, you would have a Manila branch to provide Zubuchon to the city & environs! PS – Hope Typhoon Ondoy didn’t do much damage to you & yours! ooooooooh a MUST try in my cebu trip next month. Thanks MM. I was anxiously waiting for an annual lechon eyeball post. But, this will definitely do. Thanks again. i’m so excited!!!! sorry, mm, out of topic… here’s hoping all our friends and readers of the blog in metro manila and those affected areas are safe and dry from ondoy. we’re praying for your safety..
It’s raining here in Cebu too….and I know the perfect dish to take the blues away….ZUBUCHON!!!! And then make sinigang na lechon ala marketman for dinner!!!! Saaaaaarap!!! Wow! If I were in Cebu right now, I would be one of the first customers of Zubuchon! Your price is very reasonable compared to Manila and here in the US. May God bless your crew with success in their business and may God bless you too Marketman for your support of the crew. Hi Everyone, as I type this I am watching all of the news programs on the effects of Ondoy, and the several flash floods that hit Manila yesterday. There are thousands of folks terribly affected by yesterday’s storm, and I hope that rescue efforts increase as daylight comes this morning. MM and family are fine, though for a moment yesterday it was almost certain that our home would be flooded, and we watched with a huge sigh of relief as the waters peaked at about 1 centimeter below our front door… It was quite amazing how quickly nearby creeks swelled by 10-12 feet and breached their banks… there are parts of Metro Manila that are still under several meters of water and we hope for the best. MM, you have such a joyful way of sharing, you are a good steward of God’s blessings. God’s blessings on you snd the crew. Best pig ever!! good to know you and the family are fine. sorry to see and hear about our kababayans affected by ondoy. ZUBUCHON = BEST PIG EVER!!! Lee: I bet they will give you free Zubuchon if you design them the best T-Shirt ever! I am glad your family and home are fine, MM. I have not heard of the typhoon, have not watched the news lately. Wow! just a matter of centimeters. I know how you feel watching the waters creep closer. The creek in my backyard turns into a large lake in the rainy winters and I just cringe every time I watched the waters creep closer to the deck. I am looking forward to have a taste of the Zubuchon lechon when I visit home. For sure, I will let the relatives know about it. I know in the town where I come from we usually have someone do the lechon by hand in our backyard. My uncle, God bless his soul, was a great lechonero(?). He would go home to Cebu to get his ingredients. 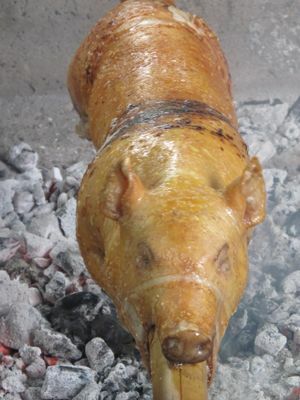 I am sure your lechon will be just like that… Yuumyummy. More power to you, MM and to Zubuchon. Gener, for details, you can email me at: m.escalada@gmail.com. I am based in Baybay, Leyte and Makati but I’ll share with you the Cebu vacation I planned and hosted for my U.S.-based siblings. They were in Cebu on Sept. 3-6, 2009 but within that short time, they had a great time. At the suggestion of Artisan Chocolatier in this blog I booked them in Casa Escano B&B. Check it out at: http://www.casaescano.com. But Mayflower Inn, where room rates are slightly cheaper, is also a worthy option. It is on Villalon Drive, just beside the Cebu provincial capitol. Mayflower Inn has no website, tel. is (63-32) 255-2800. I will email you the room rates tomorrow coz I left the flyer in the office. While in Cebu, you can book a rental car with driver and a well-informed tour guide for 3 hours, from 8:45 a.m. to 12 noon. I booked that through Casa Escano. It was well worth the city tour because the guide who knows the history well be a great resource. Then you can have your meals at the Terraces wing of Ayala Cebu where it is so pleasant. Go to Cafe Laguna in Terraces. The Filipino food we ordered — sinigang na tanguigue sa bayabas, lumpiang sariwa, green mango shake, inihaw na atay ng baboy, etc. — was so good. My guests were quite impressed, they wanted to return. For a group of 4, I only paid a little over P1k (about $25). Both Casa Escano and Mayflower Inn are quite accommodating that you can bring your 2 kg of Zubuchon and eat it in their dining area. Nice. Hopefully you can also perfect the traditional smooth skin lechon. That would truly impressive. So happy for your crew that you are giving them this business opportunity. Good luck! I hope I will have a chance to taste Zubuchon the next time I go home. Maybe by that time, you will have worked out a way to export it to Manila. loving the name, zubuchon. best of luck to your crew on their new business venture. saw the pics of the typhoon last night and today, hope everyone is safe there. will be praying for everyone. Beth, many others do the “smooth” skin… it’s not that hard, and often reached after some tricks of the trade, brushing the skin with a sugared water, soy sauce, oil, etc. I find that the versions now often commercially available are smooth and brown, but not really crisp. It actually seems almost lacquered… Lots of folks do that version, no need to add another one. 2 Zubuchon lechon sold in 2 hours!!! Awesome!! MM…can’t help but wonder…charcoal is mostly done by slash and burn…is there a way you can also make sure that the charcoal the crew buys is from sustainable resources? such as coconut husks? Since from Artisan Chocolatier’s posts,Zubuchon is already at a brisk pace. Gener, can your wife eat Zubuchon (pork)? THANK YOU to readers and their friends for your support at today’s Sunday market at the Banilad Town Center in Cebu, my understanding is that the crew brought two whole lechons and left with nothing… :) I hope you enjoyed your taste of ZUBUCHON. Salamat. Well my wife cannot eat pork as she was forbidden but im allowed and she cant stopped me as its my custom to eat pork. She may not care much since my wife is europeanized thought shes arabic, there are lot of sea foods and meat alternatives where she can enjoy too and im sure that she will love it..thanks..
That pig looks like it has a disease. I hope someday we can learn the secret to consistently smooth shiny crispy skin. This shortcut way is convenient but the texture, though still crispy, is different. Marketman, are you able to produce the lacquered version that produces really crispy skin vs the commercial ones? If so, please tell us how it’s done cuz I’d love to try my hand again at spit roasted lechon. It’s been a while since I’ve made one. Gener, please check my blogs: http://devcompage.com and http://ricehoppers.net. MM, sorry, we use the comments to your blog like a Facebook chat. Congrats on your site’s new look. Very easy to read with a lot of white space. Zubuchon is a lot healthier than lechon bought from commercial suppliers. My son did an on-the-job training in agribusiness management in one of Manila’s leading lechon makers. He learned that to make the lechon skin stay crispy for hours, MSG is brushed all over the pig. In their commissary, MSG is one of the essential supplies. Good luck to your crew on the small business venture! I hope that they can really turn in a profit and make it grow! Hope to taste this ZUBUCHON one day! Thanks to AB and to you for your efforts that they now have an enterprise venture! The lechon pictured above was done and eaten last thursday (I was privilege enough to be invited by MM…hehehehe) and MM mentioned that he was trying out a different formula thus the color and look of the skin. I can assure everyone that it tasted good. As they say, “the proof is in the eating”…or…”don’t judge a book by its cover”. The Zubuchon that the crew has been bringing to BTC is similar to the photos in the Bourdain and Soho post. 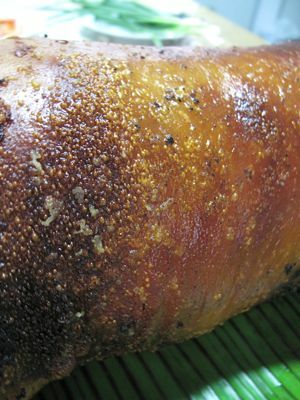 Mochikun, you may want to check out previous posts (a dozen or more) I have done on lechon, summarized here with all links, and you will realize that skin that is not “shell-lacqued” is utterly intentional. Beth, you might want to do the same, as one of my lechon chronicles did have a smooth brown skin. on-topic…that’s good to hear MM! yeah ipil-ipil do grow fast…so fast that one grew to about 2 feet tall on the top of our and our neighbor’s perimeter fence! re coconut husk charcoal..i remember seeing these in brick form i forgot the name but it was being sold in Robinsons Supermarket…but yes you’re right you might need tons of it. time to check cebu pacific or pal for flights to cebu to taste the Zubuchon! congrats to you MM and the crew. i so look forward to eating lechon skin when i fly there next month! This is so very nice of you MM! Your crew is indeed very lucky to have you as their boss :-) can’t wait to try this out on my next trip. More power! and goodluck to your crew’s best-ever lechon endeavors. hhhmmm zubuchon lechon will definitely be on top of my todo list when i go back home. i grew up eating lechon stuffed with lemongrass. definitely best pig ever!!! MM, i’m pretty sure when Zubuchon turns into a full scale restaurant, Augusto and Anthony Bourdain will be cutting the ribbon at the door. I will be going home to Bacolod next May and Cebu is on my itenerary because of this lechon. I am hoping that this will be a very successfull venture so that it will still be available when i get there. Wow! your description of Zubuchon- is soo organic! How I wish you could share the recipe so I can make my own here in the states. As soon as I come home, cebu will be in my a list of cities to come home to. thanks. missing all those otaps too. I tried the Zubuchon today and in my 20 or so years of eating lechon, the Zubuchon has been the best so far!!! I am waiting for an opportunity to order 1 whole Zubuchon. I wish your crew all the best. I hope Zubuchon will become a household name for lechons :) More power! I am definitely buying again next sunday. Bernard, thank you for trying the Zubuchon, and for such enthusiastic comments… I am glad you enjoyed it! Oh damn it! (So sorry for swearing MM) but I’m just so frustrated right now! I actually came home for a short visit from September 25 to OCtober 4 in Cebu, where I was so busy squeezing in all the good times within the short vacation that I wasn’t able to check your blog. Oh the pangs of counterfactual thoughts of having missed this Zubuchon! Please do consider Japan for a branch when you go international! wow! this is amazing. I can’t wait til my next vacation and hit cebu just to feast on Zubuchon. And the name’s so chic. Awesome! MM, can you open up a place here in Bacolod where we can buy the Zubuchon…this is one of my favorite post….i always dig your archives for more posts. Diri sa Bacolod, we love your site! The skin may look like it’s unnatural, but the way MM and crew made it is completely natural. It’s just the appearance of the skin that we Filipino’s are not used to, but if you think of biting on chicharon-crisp skin, heavenly would be an understatement. Reme, not likely as the lechonan is located in Cebu. MM, i like the rough skin lechon better than the smooth,its like chicharon lechon. i love it cooked the old fashioned way like zubuchon, it’s lesser evil to health issues. i’m thinking of buying a live wild boar to grow and breed in the farm. sometimes we raise a vegetarian pig, and i feel guiltless eating the vegetarian lechon. PLEASE, PLEASE open an outlet here in quezon city as soon as possible!!! we are so looking forward to being able to taste your lechon here!!! please inform us once you do, thank you very much!!! i’ve been home to Cebu a number of times and I have yet to taste this. Is this only for sale in Banilad Town Center? Hi Mr.MM, i would just like to drop by and congratulate you on all your posts, i really enjoy reading them all, i check out your site a lot for new posts. i even tried a few of your recipes already, the sisig in particular. I was amazed by the look of the lechon on the no reservations philippines episode, now i understand why the skin looked so crisp, just like chicharon. i am in bukidnon now, but i’m originally from germany and nasugbu batangas, lechon is always on the table here in mindanao no matter what occasion it may be. when i get back to cebu i will definitely look forward to try the zubuchon. more power to you. This is interesting. Normally, lechon in Cebu is cooked differently for retail per kilo selling and for whole sale. Lechon cooked for whole sale but sold per kilo will result in losses for the seller. This is why in Talisay (a town south of Cebu City), where the best Cebu lechon can be bought, they do not sell retail per kilo, but through negotiating the prices of cut pieces. i so miss lechon…………. wala kasi lechon dito sa UAE. kaya lechon is my number ONE missed food! lechon, streetfood, mga kakanin, etc. etc. Sir, thank you very much for the free sisig you gave me today at the airport. I’m a big fan of Zubuchon and your blog . God bless. Got me a kilo of Zubuchon at the airport… Thank God you’re there. I was on a very quick trip during the week and it really made my morning to see the bright red logo as I entered the departure waiting area. Dried mangoes? Pffsh. i think the acupuncture is the same applied to balamban liempo? Hi! Can we eat at the Banilad Town Center? Is Zubuchon located in a food court type or our only option is for the lechon order to be delivered to the hotel? Thanks!! All the best from Manila! Hi! :) I hope you don’t mind me linking you to my post. I’ve just been to Cebu last Jan and tried your Zubuchon! It’s great! being famous does not become you my dear friends ….!! I know how hard it can be… having hundreds of people lining up for your product and every once in a while you do disappoint, however it is the way to react to your customers after you fail to deliver that makes all the difference if he may or may not return a second time!! Great to see another lover of food putting quality to work! We used to breed our own pigs here that butchers loved because of the lean product but sad to say we were producing more meat than we could sell and most people were content with large lumps of fat as being the “tastier bits”. But I love the idea of using lemon grass in the feed to help flavour the meat before slaughter. Another important thing I would like to say though with you mentioning the Banilad Market is I went along and I think if you love quality and love food I invite anyone to go along there to support the various stalls. Its not a big market in size but in quality aond organic produce its one of the best locations in Cebu. Support your local enterprises I couldn’t say it anymore than that..
Aha, my puerto rican husband used to think that nothing beats their lechon back in the island. Zubuchon seriously humiliated him. Too bad.. Zubuchon is now closed in Banilad.. I went therE this morning.. Good thing zubuchon is still available in mactan airport, only that price is expensive by 40php per kilo. I bought 3kilos, its better than CnT (in my opinion).